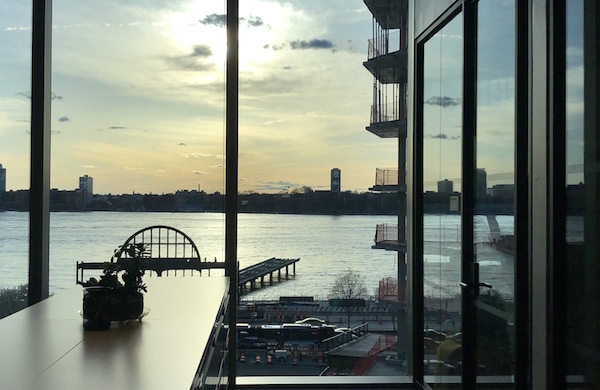 Delos has brought its vision for the workplace of the future to life. The company is focused on wellness, but their new headquarters doesn’t stop there. The space is now WELL Platinum certified and in the process of attaining LEED v4 platinum and Living Building Petal Certifications. Beyond the certifications, it’s also visually stunning. 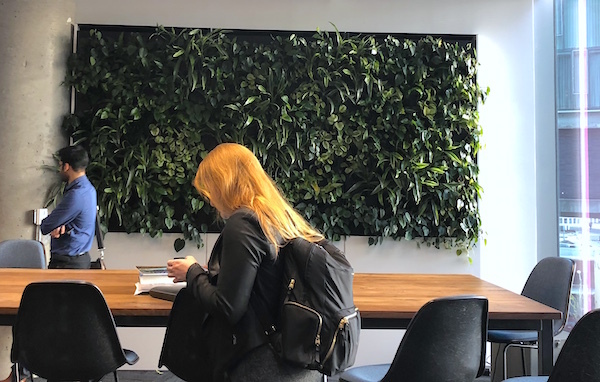 Their 19,000-square-foot office at 860 Washington Street spans two floors filled with greenery, scenery and daylighting. 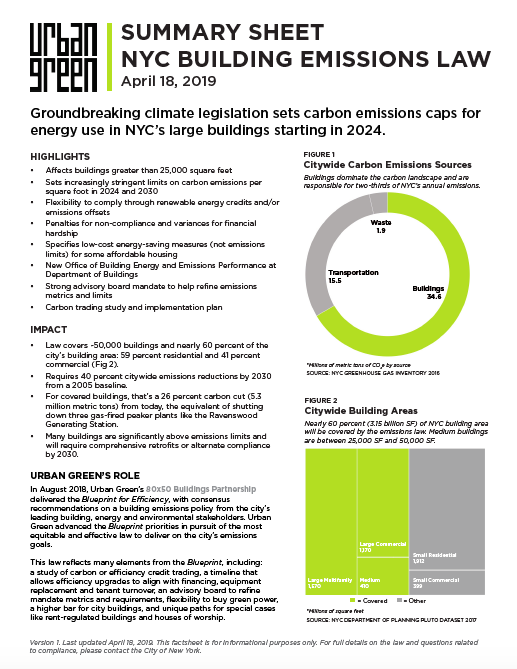 Urban Green’s recent tour highlighted several key features that are enabling Delos to achieve its building certification goals while keeping employees happy and healthy. 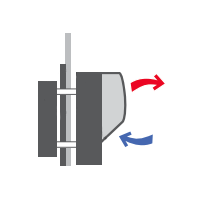 Underfloor air distribution (UFAD) pushes air from floor to ceiling. Fresh air flows from beneath your feet, picking up indoor air pollutants as it naturally rises, and is then returned near the ceiling for filtration and conditioning. This unique circulation pattern can maintain better air quality with less conditioned air (and, in turn, less energy). Active plant walls remove volatile organic compounds (VOCs) from the air. Roots, which do the heavy lifting in this process, grow through a carbon-based medium that is pest- and mold-resistant. The 15 walls contain species selected based on a NASA study on indoor air pollution abatement. Natural lighting matches circadian rhythms by shifting from cool to warm hues throughout the day. Light switches can be manually adjusted to match occupants’ moods—relaxed, focused or energetic. The space also receives ample daylighting from east-, west- and south-facing windows. Sound management is addressed through acoustic material on the ceiling that absorbs office noises. Conference rooms have perforated wood paneling to control acoustics, and speakers throughout the office broadcast a frequency to neutralize background noise. A quiet room allows employees to take a break. It is located out of sight of the main office to ensure workers’ privacy. It is also equipped with a sink and refrigerator to make sure new moms have everything they need. A 1500-square-foot terrace was designed by Harrison Green with mental and physical health in mind, functioning as a workspace as well as an entertainment area with fitness equipment. It’s also home to native plants to attract native pollinators. Information transparency is at the heart of Delos’ lobby. Two screens highlight the environmental quality and activity level in the office. 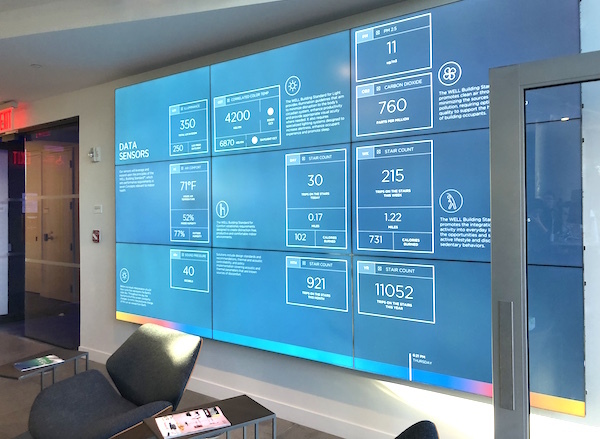 The larger display shows live metrics, like carbon-dioxide and humidity levels, gathered from 51 indoor environmental quality monitors. The second screen is located on the main staircase: Its pixels dance and move as people walk up and down the steps, playfully encouraging physical activity. A Wellness Cafe, intentionally front and center, features Energy Star appliances and reclaimed wood and steel. Fruits and vegetables are countertop fixtures to encourage healthy snacking. Employees are also provided free lunches three times a week to encourage socializing. An open, “free address” office enables employees to sit where they like. The desks are height-adjustable, and treadmill and bike desks are also available to encourage physical activity. Employee lockers further support the free address system. 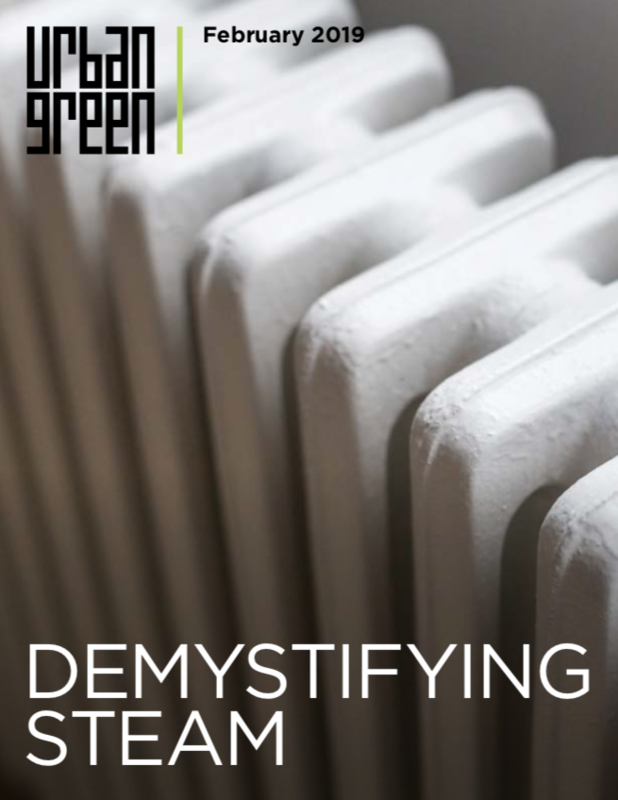 Delos is currently conducting a case study on the project, including a cost analysis to discuss the interdisciplinary approach to WELL certification. To learn more, visit https://delos.com/project/delos-headquarters. Tiffany Zau was an Education & Public Programs Intern with Urban Green during the summer of 2017. She completed her undergraduate studies at New York University and is currently finishing her Master's in Public Health with the Environmental Health Sciences department at Columbia University. She is pursuing a certificate in Climate and Health and is interested in the relationships between urban design, human health and climate resiliency.